Two years ago, my sister insisted that I needed to see Wreck-It Ralph before Christmas. I turned around and said that she needed to see the first Hobbit movie (although she’s not really a fan of Middle Earth, she loves Martin Freeman). We decided, what the heck? Let’s see them both in the same day. Thus Double Movie Day was born. This year was our third year in a row to celebrate Double Movie Day. Last year, we saw Frozen and the second Hobbit. We could very well have kept up with tradition and gone to see a Disney movie and then the final film in the Hobbit trilogy, but the big white thing in the new Disney movie scares me and I have way too many problems with what I’ve heard of the third Hobbit movie to sit through it in the theater. 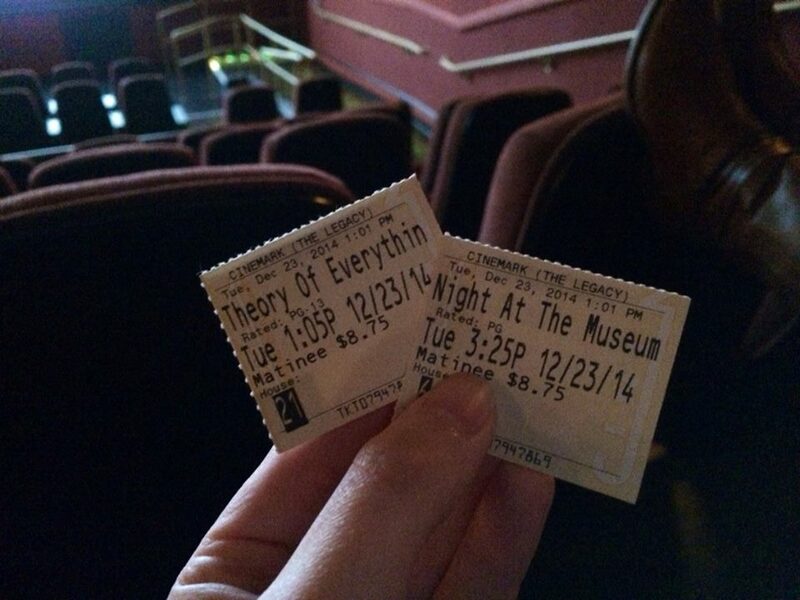 Instead, we decided on The Theory of Everything and Night at the Museum 3. *This movie looks so good. I can’t wait to see it. *Stephen Hawking is really smart. I hope I understand this movie. *I wonder what young Stephen Hawking would have said if someone had told him that he would grow up to be a guest star on The Big Bang Theory. *I had no idea Stephen Hawking was English. *Eddie Redmayne is really cute. I’m attracted to a guy playing a young Stephen Hawking. I don’t know how to feel about this. *I love guys in glasses and cardigans. *This movie is just beautiful. It’s just a beautiful movie. The music, the cinematography, the lighting, the camera angles. Everything about this movie is beautiful. *OMG his roommate is Khaleesi’s creepy brother. *Stephen Hawking asked her to dance! This is so romantic! *OMG his professor is LUPIN! *He’s not hot. Sorry, Lupin. *Must stop thinking about The Big Bang Theory. *This movie constantly has me on the verge of tears. *I’m loving this movie because it makes math, science, and intellect so beautiful. It’s brilliant and artistic. *Eddie Redmayne deserves an Oscar nomination. His portrayal of Stephen Hawking and his initial diagnosis and progression of his Lou Gehrig’s Disease is raw, passionate, and heartbreaking. *At least we know Stephen Hawking doesn’t die. *Rami Malek. You are so cute. Why are you not in the first two movies more? Why are you not in more movies in general? I need more of your cuteness. *Steve Coogan and Owen Wilson are hilarious together. *Love Ben Stiller’s caveman doppelganger. *MATTHEW FROM DOWNTON ABBEY IS LANCELOT AND OMG HE IS HILARIOUS. *Seriously, Rami Malek. Be in more movies. You were so cute in Breaking Dawn but you only had like, two scenes. You deserve your own saga. *Why is this movie so funny? Why am I laughing so hard? What am I even watching? *HUGH JACKMAN WHAT ARE YOU DOING HERE?! *Owen Wilson, I thought you should know, I’ve always had a weird Texas crush on you. *Why is no one in London questioning the Knight in Shining Armor riding through the streets on a white steed? Is this just an everyday thing in London? I do need to take a moment to be serious here before I end this post. This was Robin Williams’ final live-action film. I went in to this film knowing that I probably wouldn’t make it through without tearing up, but I didn’t expect to break down completely. I’m not going to tell you his final lines in the film, because I think they’re something you need to experience for yourself. All I can tell you is that they broke my heart. It seemed a goodbye message, not only to Larry from Teddy, but to all movie-goers from an actor we all loved dearly, and whose absence we still mourn. It’s not fair that so many movies will exist without Robin Williams. It’s not fair that such a great and wonderful life was cut short by such a tragic and shattering disease. I will undoubtedly be seeing this movie again, and I will undoubtedly shed tears once again listening to Robin Williams bid us farewell. This is a post I’ve been thinking about writing for a long time. I’m not sure what’s been stopping me, really. Maybe because it’s another one of those personal things that really doesn’t have much of a place on this kind of blog. But in wake of the apparent suicide of Robin Williams, it’s something that’s weighing heavily not only on my mind, but on everyone’s. I’m not saying anything new when I write that depression is an unpredictable disease, or that its victims often take friends and family by surprise. The illness itself is bad enough. What’s worse is being afraid to confide in anyone. That shouldn’t be the case, but it often is. I can’t speak for all victims of mental illness, but when my symptoms began, I tried to convince myself that it was nothing. I just have to will it away. Telling myself that was hard enough. It was even harder to hear it from the people I loved. I was told that I was just hormonal. I was told I was just being paranoid. I was told that I didn’t need to see a doctor. I was told that I didn’t need medication. Hearing all of that made me feel crazier than I already did. I should probably stop right there and tell you that I am not clinically depressed. My mom’s side of the family has a history of mental illness, mostly anxiety. My mom and my sister have both suffered panic attacks in the past and have been treated for anxiety. As for me, I’m more on the obsessive compulsive end of the spectrum. As I got older, it got progressively worse until finally, I would completely shut down at the thought of last minute changes. On top of that, I began suffering from PMDD. Long story short, those few days of depression a month were absolutely miserable. I felt worthless, pathetic, and worst of all, unworthy of everything and everyone I loved. If those few days were unbearable, I can’t imagine the toll chronic depression takes on its victims. Seeing a doctor and getting on anti-anxiety/anti-depression medication was one of the best things I’ve ever done, not only for myself, but for my friends and family too. I became the person I was before the anxiety and the compulsions started. I’m myself again. I love my life and everything about it. No matter what anyone says, there is no shame in seeking help. Being on medicine doesn’t mean you’re weak. It means your brain chemistry just needs a little help to balance itself out. It’s time we stopped treating mental illness as something that can be overcome by sheer willpower or by pretending it doesn’t exist. It does exist, and it claims victims, more now, perhaps, than ever before. If you are suffering from any sort of mental illness, know that you are not alone. You’re okay, I promise. I know because I’m right there with you. If you know someone suffering, listen to them, support them, and encourage them to get help. It might just save a life. Five minutes ago, I was all set and ready to write a blog post about Shark Week, Ravenclaw socks, and new reviews. Now, I’m sitting here in shock, reeling from the news headline that just flashed across my television screen. It’s weird. Actors and musicians I’ve loved before have died, but none has hit so close to home as the death of the beloved Mrs. Doubtfire, Patch Adams, and Genie. My generation grew up with Robin Williams. He was simultaneously the funniest guy you could think of and the guy who could make you cry with a single scene. It didn’t matter who you were. Everyone had seen at least one Robbin Williams movie. And everyone loved him. Right now, I have my favorite movie scenes playing in my head. I see a zany professor dancing around with his bouncing green Flubber. I hear a familiar voice serenading the fabulous Prince Ali Ababwa. I see an ambitious medical student, holding a dying man’s hand, and singing about blue skies. I see a ten-year-old boy in a 40-year-old’s body gazing in awe at a new butterfly. I see young Ethan Hawke standing on a desk, declaring, “Oh Captain, my Captain.” And I’m trying not to cry. The world wasn’t ready to say goodbye to you, Robin. And neither was I.